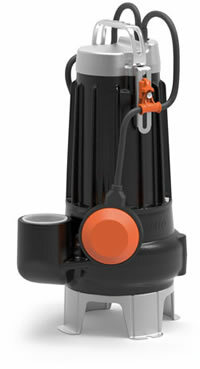 Submersible high efficiency DOUBLE CHANNEL Pedrollo pump for professional use. Built using quality materials and oversized, extremely reliable and suitable for continuous heavy duty service. Uses include dirty water, sewage, industrial waste etc. The design of the impeller optimizes efficiency while allowing the pump to handle muddy water containing solids and short fibres, without problem. The double channel impeller fitted to MC pumps makes them suitable for handling dirty water, sewage, effluent water, water mixed with mud. MC pumps are particularly suited for installation in sewers, excavation sites, wells, channels, underground carparks etc. Manufactured entirely in extremely thick cast iron, these pumps are particularly sturdy, abrasion- resistant and built to last. A purpose-built pit with minimum dimensions 800x800x800mm is required for fixed installations. Sealed induction MOTOR: with double impregnated class F winding (ensuring extended motor life and wide range of use), designed for continuous duty, even with the pump partially submerged (min. 290mm) A thermal cutout device (motor protector) is incorporated in single phase models. Three phase motors above 0.75 kW have three thermal cut-outs in the windings, connected in series with the supply cable. They must be correctly connected to the pump control panel by the user.